Oh the marvels of technology! Here I am writing this weekend’s Trader’s Report while traveling at 70 mph up Highway 99 in the San Joaquin Valley! Of course Michele is driving but I’m hooked up to my mobile hot spot, checking charts and seeing what the futures are doing. Right now they Dow futures are up 19 point but after a 300+ point sell off on Friday a bounce would not be surprising. Thanks to all the members for your patience over the last couple of weeks. Our service upgrades are complete so alerts and trade notification will be back to normal this week. Text Alert Service will be tested and activated this week. This bonus service will be at no charge to Premium and Early Warning Alert members. If you are a Premium or Early Alert member we encourage you to take advantage of this bonus service. General Market Observation: On Friday the Indexes finally produced some traction and acceleration to the downside! Each of the Indexes closed either at or just below a level of support. On the daily charts it appears that a bounce could be in the offing which could account for this year’s Santa Claus Rally. However, on the longer term weekly charts the signs are more ominous that a deeper correction may be shaping up. While very few corrections actually take place in December, the action in December is often the set up for painful corrections in either January or February. Each of the Indexes is down more than 3% from their highs of the last two weeks. With previous support finally broken be looking for where the next levels of support are located and how price reacts at those levels. Rather than provide a blow-by-blow of the individual Indexes today I want to focus on how I will plan my potential bearish Index trades and what I’m looking for. 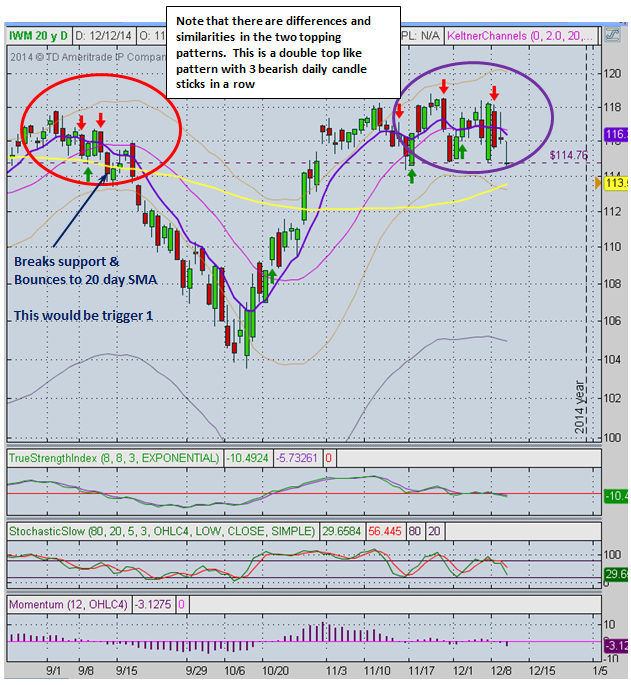 I’m going to use the IWM as a proxy for the Russell to demonstrate what I’m looking for to trigger a bearish trade. The previous top was in the late August – early September time frame are circled by the red oval. The Momentum and TSI had rolled over and going more negative. Once price broke down to the lower Keltner Channel and the 8 day moving average crossed below the 20 day moving average a short term bearish posture was established. In the purple oval it appears that something similar is taking place. There has been an 8-20 day bearish cross price has fallen just below the first battle line of support. On the chart below it shows the September top in greater detail. There were three opportunities to open a bearish position on IWM over a next 3-4 weeks while price falls. 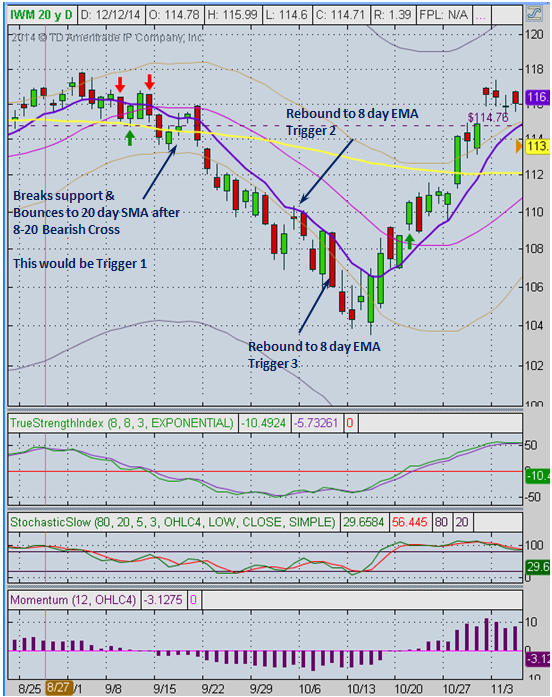 Each of these set ups were based off a bounce at the downward sloping 8 day EMA. There were three chances to profit from this downside move. Many traders believe that three thrust down is a key benchmark on market moves and there is validity to the observation, so I would be very cautious taking another bearish position until the price proved it was going lower. Additionally in this case other indicators we monitor were showing that a rebound was approaching! As it turns out the 4th touch of the 8 day was on 10/14 two days before the trigger to go long. 1. 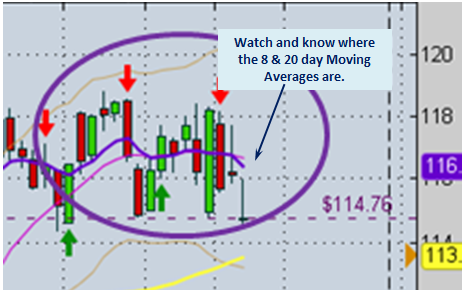 Place audio and email alerts just below the 8 day EMA around 116. I will also place an alert ½ up Friday’s price range. 2. If the alert goes off I will access if price appears to be going higher. If it does I can place a conditional order based on price falling back below my alert trigger. A bearish trade in this case would be going short shares of IWM or buying a put probably with a strike of 120 that expires in January. Why not more time? If IWM sells off the same amount it did last time, how long did it take to reach the low? It took approximately 4-5 weeks so option that expires the third week of January is just on the outside of this potential time requirement. If I miss the first trigger, I wait for the second! If price action strengthens then my posture will change from short term bearish to neutral to short term bullish. This is a fact to keep reminding ourselves of as traders, there will always be a time when we are wrong with our market posture. When we have been proven wrong moving out of that posture quickly will save us in the long run. When the convergence of clues change—don’t insist on the previous convergence of clues still being correct! For those just joining Active Trend Trading, the reason for the difference between the Margin and IRA account returns is because the Margin account up until June of this year was used as a test account for various strategies. On June 1st we have only made trades using the ATTS system in this account along with a demonstration trade with TSLA. This account is up 15.1% net since June 1, 2014. Outs & Ins: This is one of the biggest swap out of stocks on the IBD 50 list that I’ve seen since we started tracking his data point. 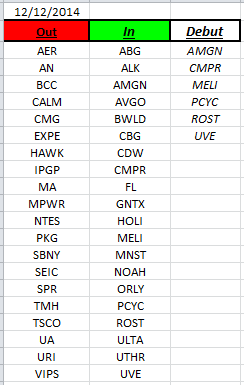 PCYC & UVE are really first timers to the list but AMGN, CMPR, MELI & ROST have been on the list in past years. The whole place was in black and white no emotions—no choice—no humanness. At the end it turns out that the Elders are actually lying to the citizens about everything especially freedom. The head Elder at the end of the show just before the hero wins the day says something that really made me think. She said, “When people have freedom of choice they always choose wrong.” This was the mindset of all the Elders, but…it seems like it also maybe the mindset of many leaders in our own society. Will we citizens always choose wrong? I don’t think so, but regardless the outcome should we have both the freedom and liberty to make that choice? The Giver thought we did!